And continuing the entertaining theme, we move on to dips, a key ingredient for any good party. I confess that I grew up on grocery store French onion dip, and boy did I eat my share of it. 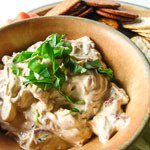 In fact a really good French onion dip such as this one and a few wavy potato chips could set me back weeks on my diet. 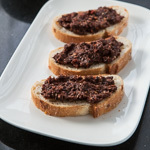 Party recipe #2 this week comes from Great Party Dips, a new cookbook from Peggy Fallon. Dips are a must for any party, and this book has tasty recipes for all kinds of dips and dunkers, giving you plenty of variety to choose from. This caramelized onion dip is creamy, rich, and full of flavor and is a great make ahead for parties as it can sit in the refrigerator for up to two days. At the minimum, let it rest for four hours to give the onion flavors time to permeate the sour cream mixture. The dip is easy to make, as the video shows, but caramelizing the onions properly takes some time, so plan for that. I have one copy of this handy cookbook to give away, courtesy of Wiley. You’ll get my review copy, very gently used, just leave a comment telling us about your favorite party dip. Please make sure your email address is correct so I can contact you if you are the lucky winner. The book can be shipped to United States, Canada, and APO/FPO addresses. The contest closes at midnight EST on Wednesday January 14, 2009, and Random.org will select the winner. Look for the announcement of the winner in this post soon after. UPDATE: Congratulations to KimL, comment #20, the winner of the cookbook! Adapted from Great Party Dips, by Peggy Fallon. In the heavy skillet, heat the olive oil over medium-low heat. Stir in the onions, balsamic vinegar, salt, and pepper. Cover the skillet and cook for about 5 minutes. Remove the lid and raise the heat to medium. Continue to cook, stirring occasionally, until the onions are soft and golden brown, about 35 to 40 minutes. Remove from heat and allow to cool. In the medium bowl, combine the sour cream and the cream cheese. Beat until smooth. Stir in the cooked onions will all the juices. Transfer to a serving bowl and cover. Refrigerate for at least 4 hours or up to 2 days. To serve, stir again and allow the dip to stand at room temperature for 15 minutes. You can substitute Greek yogurt for the cream cheese. The end result will not be as thick, but will still be rich with flavor. My standard is a spinach dip made with frozen spinach, chopped green onion and parsley mixed with light mayo and lowfat yogurt (instead of sour cream). It’s always and hit and my kids love it, too, so it’s also a great after school snack. Thanks Andrea. I love reading your recipes and forwarding them to my wife. Preheat oven to 350 degrees. In a 13x9x2 inch baking dish, combine the shredded chicken meat with entire bottle of Frank’s hot sauce, spreading to form an even layer. In a large saucepan over medium heat, combine the cream cheese with entire bottle of Ranch dressing, stirring til smooth & hot. Pour this mixture evenly over the chicken mixture to form a 2nd layer. Sprinkle celery over top. Bake uncovered for 20 minutes, then sprinkle cheese over top and bake uncovered for another 15 or 20 minutes til hot & bubbly; you don’t want the top to get browned or it will be hard. Let stand 10 minutes before serving hot/warm with celery sticks and/or any sturdy dipping chip like Tostito Golds. The dip I like is really trashy but yum. Mix some salsa with cream cheese( about 1/2 and 1/2) and microwave it for a minute or so. Its cant stop eating good. I rarely make it because I try not to have those things around me. I am having a party this weekend and I am planning on making my eggplant rolls again ( http://whatscooking.us/2008/12/11/eggplant-rolls/ ) since they were a huge success in previous parties. Great onion dip recipe. It is a must try for me. it looks like we’ve all been up to the same thing over the holidays, first muffins, now dips. i have a great recipe for smokey aubergine dip waiting to be logged about… and i am dying to try your caramelised onion number! i love onions more than anything! I am such a slacker that the only dip I make is the Harry and David onion/pepper relish dip. Mmmmmm, I want to stick my face in the bowl and lick it out! My favorite dip is garlic, artichoke & parmesan dip. It’s made from Mayonnaise, parmesan, artichoke hearts & a seasoning mix named The Garlic Of Eating from (www.tomarket-tomarket.com). I’ve never had better dip. Oh my.. I’m drooling. Always the 7 layer dip. YUMMY! Your dip looks wonderful! I love caramelized onions so I’m going to give this a try. I do make spinach dip using cream cheese instead of mayo, and with parmesan. I realy enjoy your blog! O.k., I am a little embarrassed to admit this. My favorite party dip is one that you serve with fruit. A block of cream cheese, softened, a jar of marshmallow fluff, and a package of piña colada mix (powder). I have not made this lately. I don’t think you can get that piña colada mix anymore. But my sis has improvised with coconut extract and undiluted frozen pineapple juice (a few tablespoons) with pretty good results. I swear I could just skip the fruit and lick it out of the bowl. Yes, I know, for shame! My favorite dip is a potato garlic and almond dip from Italian Cooking and Living Magazine (April/May 2004). The pistachios and parsley turn it a light shade of green and no one can ever guess all the ingredients. Great on crackers. In a food processor combine the almonds, pistachios, and garlic. With the machine running, add olive oil in a steady stream. Add parsley, potato, and vinegar and process until smooth. Add more olive oil to correct the consistency (it should not be like mashed potatoes, rather it should be a good dip). Season w/salt and pepper. Serve on crackers or bread. Hint – make one day ahead if possible. It tastes better after it has cooled and the flavors blend. Use a large bowl for the preparation. Pour the lime juice into this bowl. Add the salt and stir, letting it mingle away. Cut each avocado in half and remove the pits. Now it’s time to get your hands dirty! Trace quarter-inch slices of avocado flesh along the length of the halves, then along the width. Be careful not to cut through the skin. Each half looks like a handful of uneven cubes. Hold a half over the bowl, and peel the skin away from the flesh, coaxing a cascade of avocado chunks into the bowl. Some pieces may need an extra push, and that’s when your fingertips dip into a slick coating of avocado. Repeat until all the avocado finds its way into the bowl. Add the scallions, cilantro, cumin, and cinnamon. Lightly mash and mix together all ingredients with a fork or potato masher, allowing the avocados to still be a bit chunky. 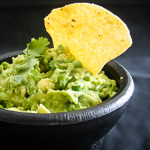 I usually serve the guacamole topped with sour cream, Greek yogurt or Creme Fraiche, in a deep wooden bowl sided by a generous amount of tortilla chips. Golly — this is Lipton Onion Soup Dip for grownups! I already have this cookbook, so I hope the winner enjoys it as much as I have. I can never pass up a 7-layer dip! I am all about the 7 layer dip. Would love to win this book! I grew up on Lipton Onion Soup Dip too, and I love it! This dip takes it to another 5 levels! I can just imagine how wonderful it is with the caramelized onions. It looks amazing! I’ve often eyed the onion dip – this really looks like a great party dip! Hi, Andrea. 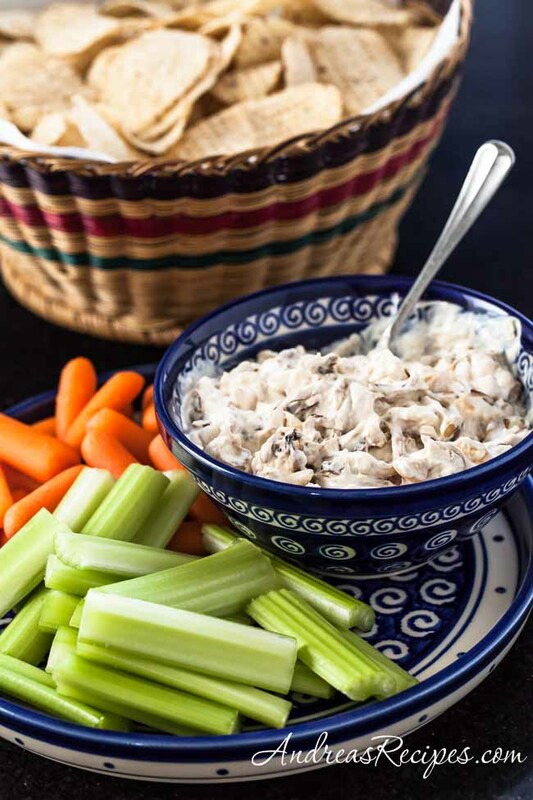 My favorite party dip is one a co-worker gave me many years ago – it’s always popular and is perfect for a Super Bowl party. Combine cream cheese and dressing mix thoroughly. Mix in beer and cheese. Refrigerate for 2-3 hours, till flavors marry and dip firms up. This dip is very firm once refrigerated, so it’s best served with fresh veggies (carrot and celery sticks), crackers or pretzels. It can also be molded into shapes. For a Super Bowl party, I shaped it like a football and used some strips of cheese to make “stitches.” For a Christmas party, I shaped it like a tree ornament and used strips of red and green bell pepper to decorate it. Why, the onion dip of course! Caramelized onions rule! I love onion dip! I love all dips! I would love that book! My -favourite-? That’s difficult. But I’ll settle with two. Simply because I’m difficult as well. And can’t make decisions. One is guacamole. I’m simply addicted to avocados. I love them so much. The other is a hot crab dip my aunt makes combining canned crab, minced onion, mayonnaise, and shredded cheese. You usuallly hhave to let it sit for about fifteen minutes after you take it out of the oven as the grease settles on top and you sop it up with paper towels. It’s so horrible, but it tastes amazing. My husbands fav dip is “Mexican Chili Dip.” It is neither real Mexican nor real chili. Heat the chili and cream cheese in the micro for abt 30 sec. Mix them together and put it in the bottom of a big glass dish. (9×13?) Smear the salsa on top. Top with cheese. Throw in the oven until bubbly… about 20-30 mins. Enjoy with tortilla strips. I think my old time favorite has to be the lipton onion soup mix with sour cream. Your onion dip sounds delicious though! Lately I have been making bean dip with jalapenos in the food processor though!! Hard to pick a favorite, thanks for new ideas. My favorite dip is buffalo chicken dip. It’s so good! Have always wanted to try a caramelized onion dip, but am usually lazy and reach for the Lipton’s. My favorite dip is hot artichoke…blissfully devoid of any spinach to make it at all healthy. A can of artichoke hearts, mayo, Parmesan, Romano, mozzarella, and garlic. Bake and slather on fresh sourdough baguette slices. Mmmmm. Thanks to everyone who entered! The contest is now closed. Please check back in the next day or so for the announcement of the winner. That caramelized onions dip looks and sounds so good!